Hegemony is as old as Mankind" -Zbigniew Brzezinski(2), former U.S. National Security Advisor. The "New Middle East" project was introduced publicly by Washington and Tel Aviv with the expectation that Lebanon would be the pressure point for realigning the whole Middle East and thereby unleashing the forces of "constructive chaos." This "constructive chaos" --which generates conditions of violence and warfare throughout the region-- would in turn be used so that the United States, Britain, and Israel could redraw the map of the Middle East in accordance with their geo-strategic needs and objectives. Secretary Condoleezza Rice stated during a press conference that we are seeing here [in regards to the destruction of Lebanon and the Israeli attacks on Lebanon], in a sense, is the growing the "birth pangs"of a "New Middle East" and whatever we do we [meaning the United States] have to be certain that we are pushing forward to the New Middle East [and] not going back to the old one. Anglo-American occupied Iraq, particularly Iraqi Kurdistan, seems to be the preparatory ground for the balkanization (division) and finlandization (pacification) of the Middle East. Already the legislative framework, under the Iraqi Parliament and the name of Iraqi federalization, for the partition of Iraq into three portions is being drawn out. (Click the link in the title to see the map). The overhaul, dismantlement, and reassembly of the nation-states of the Middle East have been packaged as a solution to the hostilities in the Middle East, but this is categorically misleading, false, and fictitious. Many of the problems affecting the contemporary Middle East are the result of the deliberate aggravation of pre-existing regional tensions. Sectarian division, ethnic tension and internal violence have been traditionally exploited by the United States and Britain in various parts of the globe including Africa, Latin America, the Balkans, and the Middle East. Iraq is just one of many examples of the Anglo-American strategy of divide and conquer. Other examples are Rwanda, Yugoslavia, the Caucasus, and Afghanistan. Amongst the problems in the contemporary Middle East is the lack of genuine democracy which U.S. and British foreign policy has actually been deliberately obstructing. Additionally, the United States has deliberately blocked or displaced genuine democratic movements in the Middle East from Iran in 1953 (where a US/UK sponsored coup was staged against the democratic government of Prime Minister Mossadegh) to Saudi Arabia, Egypt, Turkey, the Arab Sheikdoms, and Jordan where the Anglo-American alliance supports military control, absolutists, and dictators in one form or another. The latest example of this is Palestine. The following are important excerpts and passages from former U.S. National Security Advisor Zbigniew Brzezinski's book, The Grand Chessboard: American Primacy and Its Geo-strategic Imperatives. Brzezinski also states that both Turkey and Iran, the two most powerful states of the "Eurasian Balkans," located on its southern tier, are "potentially vulnerable to internal ethnic conflicts [balkanization]," and that, "If either or both of them were to be destabilized, the internal problems of the region would become unmanageable." "And when he had opened the fourth seal, I heard the voice of the fourth beast say, Come and see. And I looked, and behold a pale horse: and his name that sat on him was Death, and Hell followed with him. And power was given unto them over the fourth part of the earth,... Revelation 6:7,8a KJV. 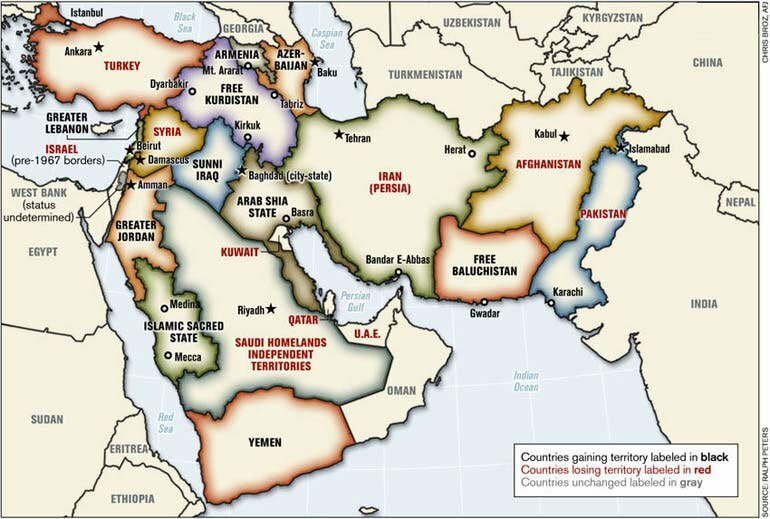 (1) Mahdi Darius Nazemroaya, Plans for Redrawing the Middle East: The Project for a New Middle East, Global Research, November 18, 2006. (2)Brzezinski, founding director of the North American Trilateral Commission, the brainchild of David Rockefeller, has stated "National Sovereignty is no longer a viable concept", and that "Marxism represents a further vital and creative stage in the maturing of man's universal vision. Marxism is simultaneously a victory of the external....... a victory of reason over belief. Zbigniew Brzezinski, David Rockefeller and other members of the Council On Foreign Relations and Trilateral Commission may be regarded as a traitors of the sovereignty of the United States. Barry Goldwater in his epic, With No Apologies stated regarding the Trilateral Commission: David Rockefeller's newest international cabal...It is intended to be the vehicle for multinational consolidation of the commercial and banking interests by seizing control of the political government of the United States. Their total control is now complete. (3) Milton W. Cooper, Behold A Pale Horse, (Flagstaff, AZ: Light Technology Publishing, 1991) 177. THE SAFETY IS OFF; THE THE TRIGGER IS COCKED; THE ONLY THING NEEDED FOR FULL SCALE IMPLEMENTATION IS THE EVENT! Will it be bio-terrorism, will it be assassination, will it be an illegal alien uprising?